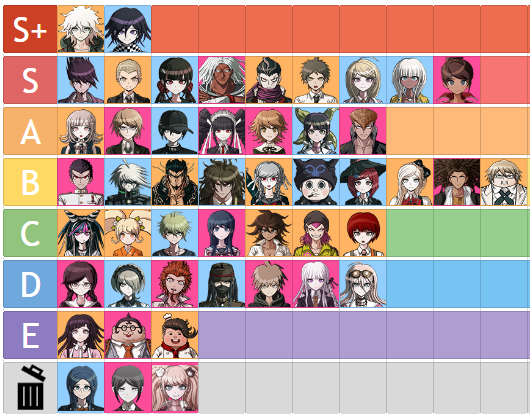 I compiled Danganronpa based elimination forum games and a few members' rankings to create Flipline Forum's average opinion on the Danganronpa cast. If you want your ranking included, either PM it to me or post it in the topic. Also, if you have another idea for a forum game, post it here or start it yourself! I’m surprised that Kyoko is a low as she is, however I didint expect her to be in the top half. Still. It's all me, I KOd her, I started hurting her, I ranked her low in my ranking. I really don't like her character. What about Miu? That was also me. Kyoko is really just there, while Miu is actively bad. they are... different from mine. Actually, flip my ranking upside down and you're closer to his. We agree on maybe 3 out of 48 characters, which is honestly interesting. So many characters I thought were universally loved were in the 30's and 40's for him, and some commonly hated characters are in his top 10. The only constant is that everyone loves Gundham. speedo3539 submitted his ranking. Gundham stays firmly at the top. I was bored so I turned my ranking into a tier list. I find it easier to read this way. May I ask why you have Gundham ranked 44th? I figure you must not get him, he is an unusual character.